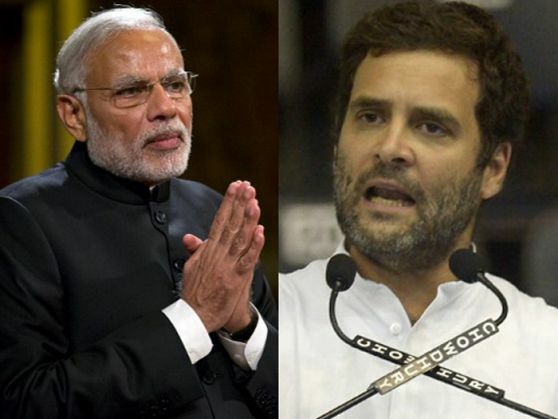 Home » national news » Modi's champoo vs British Buddhu: Rahul ko itna gussa kyu aata hai? Modi's champoo vs British Buddhu: Rahul ko itna gussa kyu aata hai? Hitting back over BJP leader Subramaniam Swamy's allegation questioning his nationality, Rahul Gandhi on 19 November accused Prime Minister Narendra Modi of "throwing mud" on him through his "cronies" and dared the government to "jail" him if he is guilty. Addressing a Youth Congress gathering on the occasion of the 98th birth anniversary of Indira Gandhi, he also accused the RSS and the BJP of throwing mud on his family members ever since he was a child, asserting that he is "not going to be scared" by such things and that he will continue to fight against BJP. "Ever since I was a child, I have been watching people from RSS and BJP throwing mud at my grand mother, my father and even my mother. I want to say one thing. Modi ji is now the Prime Minister of India. Different kinds of allegations are levelled against me. There is not even an iota of truth in them. "Modi ji, it is your government. You have the agencies. Get a probe done against me and send me behind bars if you find something. Stop all this--the mud that you throw at me and my family through your cronies. You are not in opposition, you are in government now," Gandhi said amidst cheers from the youth Congress activists adding he did not have an "iota of fear" on the issue. He did not direct refer to Swamy but was apparently referring to his allegations on the basis of documents purportedly showing that Gandhi had claimed himself to be a British national before the company law authorities in the UK for setting up a company. Swamy had demanded that Gandhi be stripped of Indian citizenship and Lok Sabha membership. He had written to Modi and later to Lok Sabha Speaker Sumitra Mahajan. Rejecting the allegations, the Congress Vice President today said," I have not even an iota of fear. I will not withdraw (from attacking Modi). I will continue to fight for the poor, the farmers."